RAMUS|EVANS Collaborative presents GWAITH as part of Cardiff Contemporary Festival with Cardiff Contemporaries. The Ramus|Evans Collaboration formed when Natalie (Ramus) and Lisa (Evans) met a year ago (September 2015) at the beginning of the MFA course at Cardiff School of Art and Design where they shared a studio space. Despite having very different art practices and research areas, Natalie and Lisa were interested in seeing how, whilst sharing a workspace and endless conversation that their work seemed to fit into the same dialogue. As …this was noticed, discussions in relation to the subconscious collaborative aspects of working within a space and the way this informs the work began to take place. Conversation, discussion, analytical dialogue and supportive critique passed over their desks as they developed their practise. During the MFA Natalie and Lisa organised two exhibitions showing their work in an acknowledgement of the blurring of boundaries within a shared space; of the potential for an art practise to grow within a creative environment, of the shared space as an informing context which influences the work that is made. 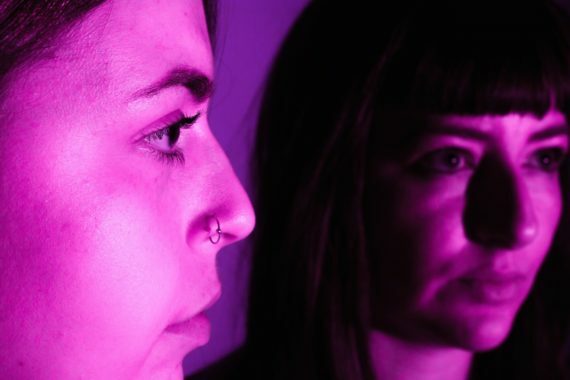 As female artists, Natalie and Lisa are keen to explore collaboratively the potential for occupying space and engaging in dialogue in relation to gender and the body through research based practises. Natalie and Lisa have since completed their MFA studies and no longer share a work space. GWAITH is a durational performance which will be shown as part of the Cardiff Contemporaries exhibition. Ramus|Evans will explore the tension and support that comes with working relationships. Since completing their studies, Natalie and Lisa have been faced with the questions of what they will now do? What is the next step in their career path? What jobs do art qualifications entitle them to? Contained within a confined space over a series of days with minimal materials, repetitive actions will take Ramus|Evans on a journey through the ritual and madness of mundane labour. By taking the ritual of the workplace into the gallery they will ask the questions; When does the artist stop making art? And where does the performance end?